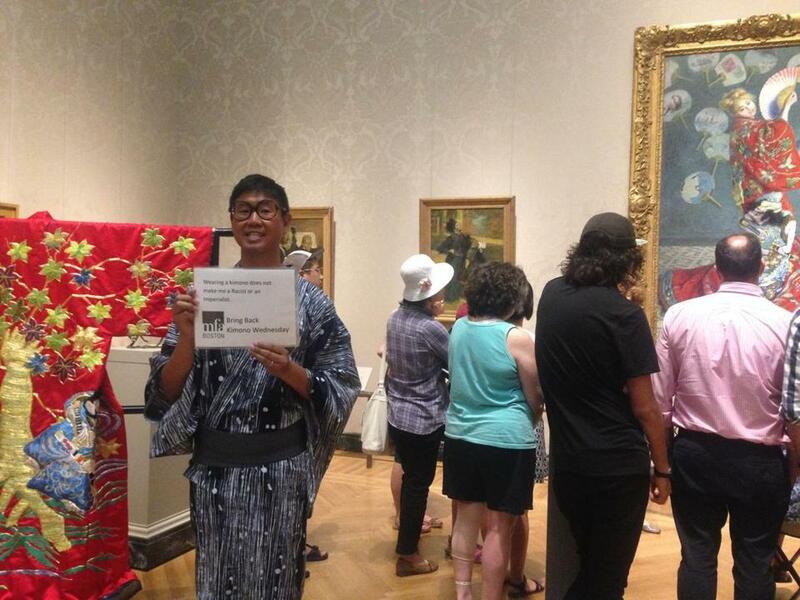 Timothy Nagaoka showing his support for the original “Kimono Wednesdays” program at the Museum of Fine Arts. The mood in the Impressionist gallery at the Museum of Fine Arts Wednesday evening was slightly tense as dozens of visitors gathered for a reconfigured “Kimono Wednesdays” event. Many had questions about the kimonos on display next to Claude Monet’s “La Japonaise,” and following a talk about the painting, visitors asked “Spotlight” speaker Wendy Dodek to explain the MFA’s change in programming. Isabella Bulkeley, a public relations associate at the museum, said that Dodek aimed in her talk to emphasize the painting’s historical context. Throughout the evening, a group of about a dozen people who opposed the event milled about, with some engaging visitors and posing questions to museum staff about Monet’s intentions, Orientalism, and the way the event was framed. The group had brought fliers outlining some of their complaints, but at the request of museum staff, they did not distribute them. Staging a personal counter-protest, Timothy Nagaoka, 37, who teaches Japanese to fourth and fifth graders in Boston public schools, said he was upset that the MFA is no longer letting guests try on the kimonos. Ames Siyuan, 26, of Cambridge, said she was disappointed by the way the museum was handling the event. She said she was particularly frustrated by what she perceived as a lack of knowledge about the kimono in “La Japonaise,” citing the limited information the speaker was able to provide about the kimono design’s significance.